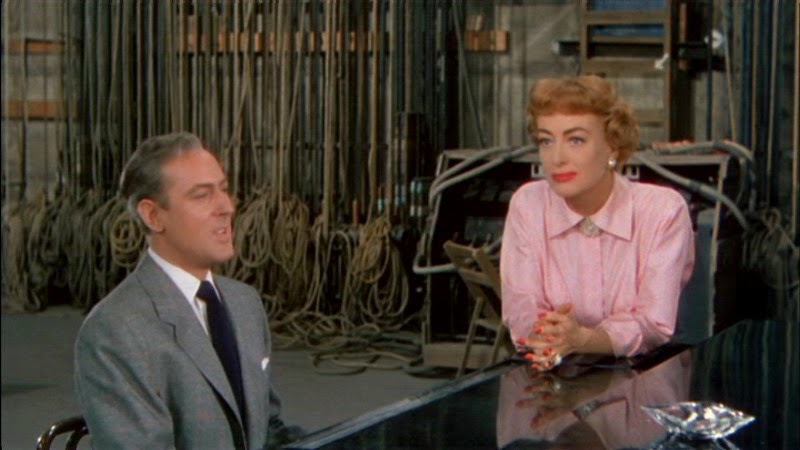 A bewildering Joan Crawford dramatic romantic musical vehicle, Torch Song is a ludicrous love story made worse by a garish visual style that assaults the senses. Broadway star Jenny Stewart (Joan Crawford) is in rehearsals for her new show. She is a demanding diva with an uncompromising attitude and a sharp tongue, and maintains a tepid relationship with boyfriend of sorts Cliff Willard (Gig Young). When the regular rehearsal pianist fails to show up, his replacement is the blind and soft-spoken Tye Graham (Michael Wilding), who starts to rile up Jenny by introducing his own musical ideas and firing back at her insults. But she is anyway slowly attracted to him, as it becomes clear that he aims to win her heart. Jenny begins to enjoy sparring with Tye, and starts spending more time with him. Unsure why she is beginning to care about the blind and romantic pianist, Jenny turns to her mother (Marjorie Rambeau) for advice. Gradually, the secret of Tye's infatuation with Jenny is revealed. Directed by Charles Walters, Torch Song marked Crawford's return to MGM, the studio she had left in 1943. It is also Crawford's first film in colour, a fact rammed home with ridiculous fashions and set designs that transform the film into a disorienting kaleidoscope. The film was slapped together in about three weeks, and it shows. The production reeks of recycled sets freshened up by paint, and with no budget for elaborate musical numbers, the story mostly offers up rehearsal numbers. The drama fails to compensate for the abject miserliness, an inane romance and unconvincing performances combining to bad effect. Crawford overacts as the theatrical diva, and is unable to generate any genuine star charisma to justify the behaviour. Her song and dance numbers are stiff and awkward, and late in the film there is a dumbfoundingly awful and inexplicable blackface rendition of Two-Faced Woman that drops onto the stage like an anvil to squash the last breath out of the already gasping film. Co-stars Michael Wilding and Gig Young are, ironically, on par with the material. Both are billed several notches higher than their limited talents deserve. Young's character is unceremoniously abandoned well before the end of the film, not that his presence or absence is noticeable either way. Somehow, Marjoie Rambeau nabbed a nomination for the Best Supporting Actress Academy Award for a minuscule and conventional role. A misfire at all levels, Torch Song is just wrong.